The original analysis for this project was conducted using Excel. To improve openness and reproducibility, I re-analysed the data using Python as described in my post on the subject. Since the new analysis agrees with old analysis but it considerably easier to work with, I suggest that the new analysis is used for all future citation. In which case, please cite "S.J. Hettrick et al, UK Research Software Survey 2014",​ DOI:10.5281/zenodo.1183562. The data is licensed under a Creative Commons by Attribution licence and the analysis is licensed under a BSD 3-clause licence (in both cases attribution to The University of Edinburgh on behalf of the Software Sustainability Institute). (Of course, the old and superseded analysis is still available too: DOI:10.5281/zenodo.14809 and released under the same licence as the new analysis). If we do not know how much we rely on software, we cannot ensure that researchers have the tools and skills they need to stay at the forefront of research. We collected evidence – for the first time at this scale - of research software use, development, and training. In addition, we collected demographic data so that we can investigate questions like “Are men more likely to develop software than women?” (the answer, as it turns out, is yes - but women are equally likely as men to use research software). Thanks to Mario Antonioletti, Neil Chue Hong, Steve Crouch, Devasena Inupakutika, and Tim Parkinson for their help constructing the survey, developing the underlying code and analysing the results. Thanks also to our Fellows for being guinea pigs during the drafting of the survey. The survey results described here are based on the responses of 417 researchers selected at random from 15 Russell Group universities. We gained good representation from across the disciplines, seniorities and genders. This is a statistically significant number of responses that can be used to represent, at the very least, the views of people in research-intensive universities in the UK. The main problem of running a blind survey is that it needs to be short to maximise responses. This means we’ve had the opportunity to uncover facts about software use, but we haven’t had the space to investigate causes. We will be running follow up research to do so. How many researchers use software? It’s not overstating the case to say that software is vital to research. If we were to magically remove software from research, 7 out of 10 researchers would be out of a job. 92% of respondents said they used research software. More importantly, 70% of respondents said that “It would not be practical to conduct my work without software”. The use of research software varies little with seniority. It’s difficult to measure seniority, so we simply asked how many years the respondents had worked in research. There isn’t a great deal of variation: the percentage of use varies by 12% with those having worked in research for 6-10 years reporting the most use (98%) and those having worked for more than 20 years in research reporting the lowest use (86%). The first two categories – those have worked less than a year, and those that have worked for 1-5 years – report 91-92% use. Use peaks in the next ten years and then drops in the 15-20 year and more than 20 year groups. There are different ways to explain this variation. Unfortunately, they cannot be confirmed by our data. It seems likely that low- and mid-seniority researchers are the workhorses of research and do the most generation of results – and hence are most likely to use software. Once a researcher gets more senior, there is the tendency to perform more management duties which makes them less likely to use research software. A lot of different software is being used: we recorded 566 different packages - some of them have only one user within our surveyed community, some with many. 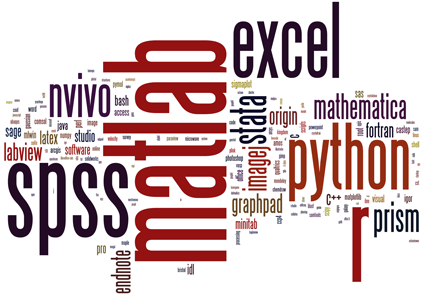 The most popular packages are Matlab (20% of respondents use it), R (16%), SPSS (15%), then Excel (12%). To show the use diagrammatically, we created the Wordle shown at the top of the page. It’s not just proprietary software, many researchers are developing their own code: 56% of them. This is great news, because the real power of software lies in developing it to allow you to do more in less time and make new research possible. Many people in the research community are developing their own software, is the development in safe hands? 55% of respondents have received some training in software development (15% self taught and 40% had received some form of taught course). Worryingly, 21% of respondents who develop their own software had no training in software development. That’s one in five researchers developing software blind. Software that is developed without adequate training is unlikely to be reliable. Researchers are, by their very nature, intelligent people who learn new skills quickly, but there are many subtle pitfalls in developing good code (that is, code that won’t later lead to paper retractions). And that’s only the case for reliability! We want defensible results, which requires a whole swathe of skills related to producing reproducible code, and we want to protect the research investment, which requires yet more skills for writing reusable software. The primary funder is a useful way to split respondents into different disciplines. Around half of our respondents were primarily funded by the EPSRC, university central funds and “other” (which drew together a wide range of funders from private funds to overseas research funders). The other half of respondents were split fairly evenly over the remaining research councils, EU funding and the big trusts and charities. The use of research software is fairly even across all respondents regardless of their primary funder: something in the region of 87-100% is typical. The notable exception was respondents primarily funded by the AHRC, of whom only 60% use research software. The gaps begin to appear when we look at respondents who develop their own software. Respondents can be split into three groupings. Leading the way are STFC-, NERC- and EPSRC-funded researchers with 93%, 90% and 79% of them, respectively, developing their own software. The next grouping occurs around the 50% mark – a group that contains respondents funded by most of the other funders. The third group is made up of respondents funded by the National Institute for Health Research (31%), industry (17%) and the AHRC (10%). Many researchers believe that including costs for developing software in a proposal will weaken it. We’ve had steer from the Research Councils that this is not the case - something we’re trying to persuade the research community to believe. But we may have our work cut out. Women made up 36% of respondents to the survey, men made up 62% and the remainder went to “other”, “prefer not to say” or no response (the gender question was not mandatory). There is no difference in the percentage of women and men who use research software: 92% each. This is heartening news! Although there is no difference in the use of research software, there is a huge difference when it comes to developing software: 70% of men develop their own research software, whereas only 30% of women do. This preponderance of men in development is reflected, as one would expect, in training. Only 39% of women had received software development training of some form, relative to 63% of men who have received training. What can you tell from a researcher’s operating system of choice? There is a difference, albeit not a great one, when it comes to simply using research software: 88% of Windows users are also users of research software, as compared to 93% for OS X and a remarkable 98% for Linux. When it comes to developing research software, the differences become apparent. Only 41% of Windows users develop research software, which again is slightly behind OS X at 53%. 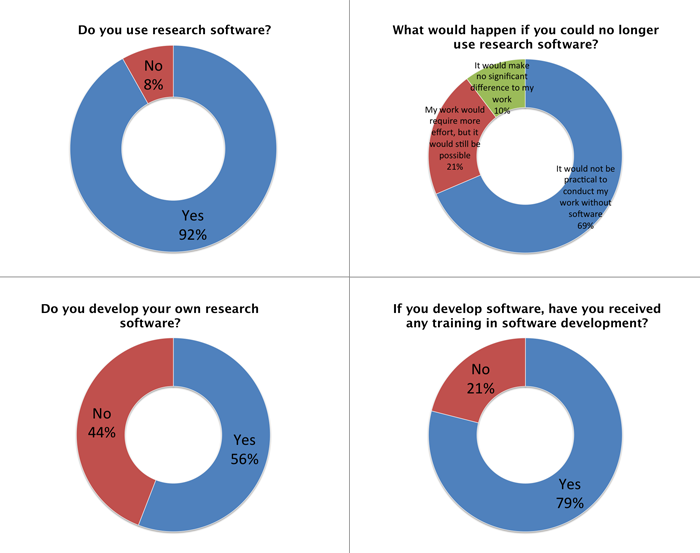 Linux users are in a field of their own: 90% of them develop their own research software. There’s potentially an important lesson in here for the software development community. If you want to people to use your software, you really better make sure that it runs on Mac and Windows as well as your native Linux. We needed results that would represent the research community, so we ran a survey that contacted 1,000 randomly selected researchers at each of 15 Russell Group universities. From the 15,000 invitations to complete the survey, we received 417 responses – a rate of 3% which is fairly normal for a blind survey. We used Google Forms to collect responses. The results were transferred to Excel for analysis and then uploaded to Google Drive for distribution.